Sometimes making one small change in a routine you’ve been doing for what seems like forever can really make a profound difference. Most times we just go about our habits and meander down familiar paths without thinking to alter our course. It’s normal and perfectly alright to gravitate towards whats easy and what’s been done, because why fix something if it ain’t broke, eh? For the most part, I think there’s a lot of wisdom in this sentiment because it means we have found comfort and warmth in whatever it is we are doing and continue to do each day. That is important and essential to wholesome living. But I also know that sometimes making a small change in the way we do things can leave us feeling renewed and refreshed without having had to take extreme measures. Say, a little spritz of lavender oil on your pillows before bedtime. Trust me, you’ll sleep so sound. Or the addition of music to your daily chores. This dramatically impacts my mood and brings an air of beauty to my mornings. Little things like this, nothing big here, can boost your spirits and shake things up for the better. This simple morning recipe is an example of that. I’d hardly call it a recipe and more of a how-to, I suppose. 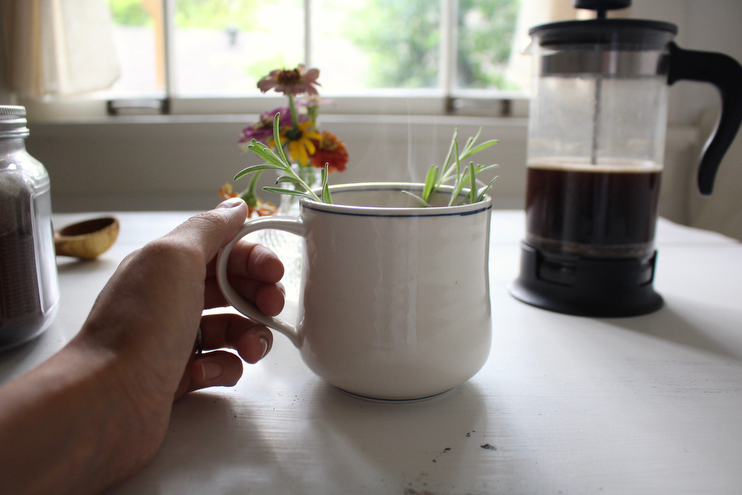 I have been adding fresh rosemary to my morning joe throughout this warm summer season. It’s a yummy way to start my day and gives me a chance to step outside and snip some herbs, which I always enjoy. Adding fresh herbs and other natural tidbits to your coffee can really change up your coffee game. Have any of you tried this before? I’d love to know of other good additions to coffee if you have any! Heat water in your kettle. 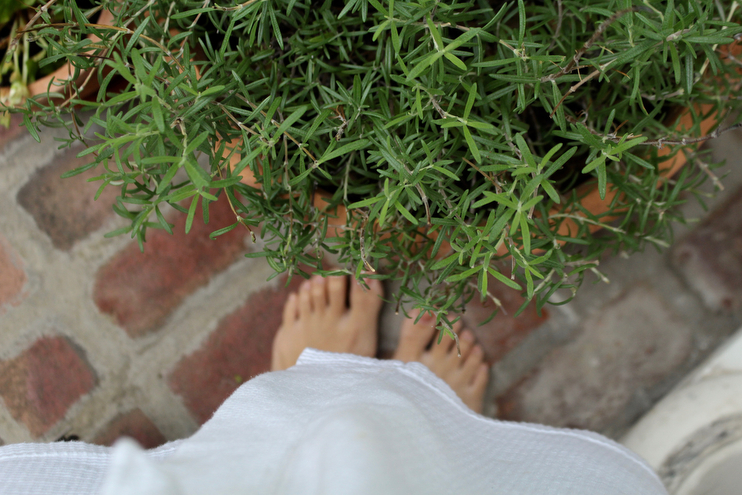 While the water is warming up, step outside into your herb garden or to your patio planters and snip a few sprigs of fresh rosemary. It is very important that the herb you use for this is fresh and not dried. It makes all the difference. Now is a good time to add two (or one or four) scoops of your favorite coffee to your French press and prepare the rosemary. Remove the tiny leaves from the woody stem and chop away making the pieces rather small! You can also tear them with your fingers, sometimes I do this. 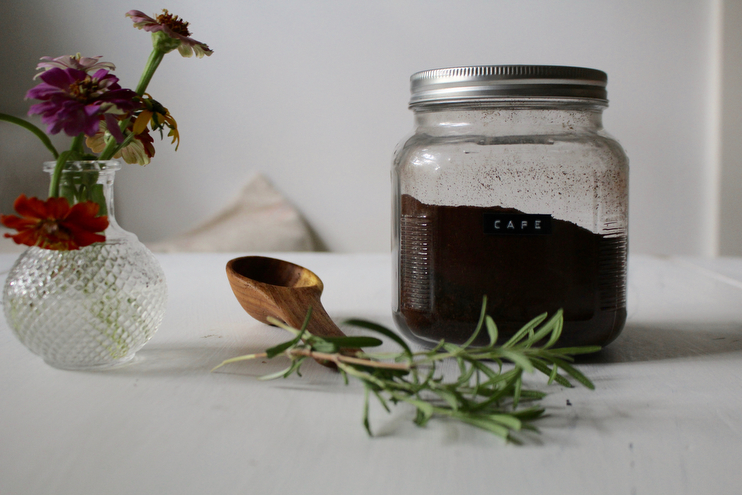 Add the rosemary on top of the coffee grounds in your French press. When the water is boiling, remove the kettle from the fire and let it sit for about thirty seconds. It’s never good to pour boiling water onto your coffee grounds because it will burn it. After you’ve hummed a good song or checked on the kids to make sure they are not coloring on the couch, go ahead and pour hot water into your press up to the top. Stir well and then let steep. How long you steep the coffee grounds + rosemary is personal preference but it’s always good to allow for at least 3 full minutes to get the best flavor. Once stirred and steeped, plunge away and serve however you like. I take a small scoop of sugar and cream. Stir with a hearty rosemary stem and enjoy all cozied up in your robe. Simple and lovely. You can change up with recipe very easily by using lavender, mint or even citrus peels believe it or not. Andrew and I love one of our local bakery’s orange peel cold brew that they sell at our nearby market every Saturday morning in the summer. It actually inspired me to come up with this herbal brew a few months back! I hope you give this try and enjoy, m’dears. And I have to say, I saw about seven brown leaves outside on our front porch this morning…autumn is coming! This looks wonderful and I will try it right away. Rosemary is my favorite spice. A favorite family dinner in our household is Rosemary Chicken. I love to fill the house with the homey smell of Rosemary so I can only imagine how lovely it will smell when coupled with coffee. I hope you dont mind me asking but that white mug with the blue line is lovely, may I ask where it’s from? Just tried this yesterday for a summer lunch outside and my guest and i loved it! very refreshing. I love your page! And the photos are just amazing. I was trying for a while to switch from coffee to Rosemary lemon tea in the morning (trying to have healthier habits and reduce my caffeine intake). But I wasn’t able to get rid of the coffee.